New NEMA17 bipolar stepper motor. Ideal for 3D Printers and other applications. 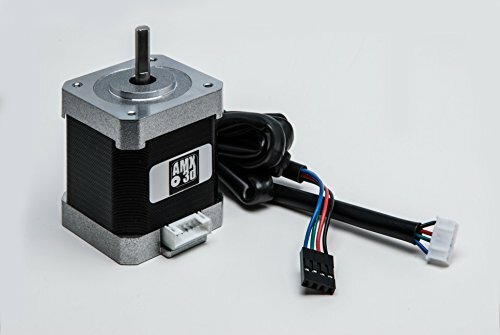 The Motor is a 2A, 1.8deg, single shaft (20mm long, 5mm diameter) model with holding torque 84 oz-in/0.59 N.m. 4-wire connection (Black, Green, Blue, Red) with plug on motor. Wiring harness is 1 Meter long with plugs on both ends.. Please see the installation instructions for information on modifying connector wire sequence for your application. If you have any questions about this product by AMX3d, contact us by completing and submitting the form below. If you are looking for a specif part number, please include it with your message.